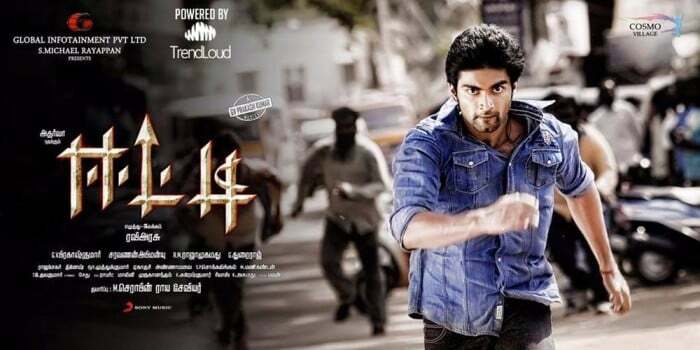 Eetti aka Eeti is one of the few Tamil Movies that are focused on Sports. Usually these Sports-Centric Movies receive a lot of attention among Audience. Director Ravi Arasu gave a action-packed film this year with enough Romance, Comedy and every ingredient required by a Commercial Film. Atharvaa as Pugalendhi aka Pugal is an Athlete based on Tanjore. He broke records on InterCollege Hurdle Race at National Level. When he goes to Chennai for a Sports Event, He saves Gayathri’s (Sri Divya) Brother from a Fake Currency Mafia. He gets in fight with one of the important members of the Mafia and triumphs over him. So this makes him a target for the Mafia. The Whole Story comprises of how the lead actor solves these issues. Actor Athaarva rocked as the lead actor with a well toned body for an athlete. Sri Divya looks cute in the movie.